The image of the deceased. Al Bahnasa, Egypt. Saitic period. Image: Ahram Online. 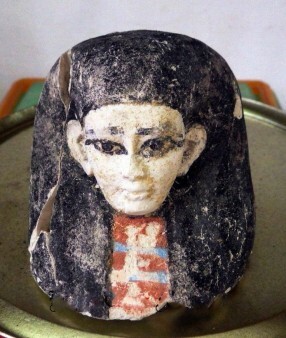 Two 26th Dynasty tombs still containing a number of interesting grave goods have been discovered during the work of a joint Catalan Spanish-Egyptian team at the site of Al-Bahnasa, where the ancient city of Oxyrhynchus once was. A number of mummified fish (one being an Oxyrhynchus, the city’s symbol) have been notably found in the tombs. The 26th Pharaonic Dynasty, also called Saitic as its kings were originating from the Egyptian city of Sais, reigned from 685 to 525 BC and characterizes a period when Egypt is regaining its territorial power which had been previously lost to the Assyrians, and forms alliances with the Lydians and also the Greeks. The end of the period is marked by Egypt’s conquest by the Persians. According to a statement by the Ministry of Antiquities, the first tomb belongs to a scribe whose his name is not yet identified. The tomb houses some of his funerary collection. A bronze inkwell and two small bamboo pens were found beside the deceased’s mummy, which is in a very good state of preservation. As for the second tomb, it belongs to a priest, head of a family of priests who served in the nearby Osirion Temple. Here, a large collection of stone sarcophagi was found along with canopic jars of alabaster which bear hieroglyphic texts, as well as a collection of bronze Osirian statuettes and bronze coins. Within the structure the team also claims to have revealed one of the earliest representations of Jesus Christ, accompanied with a Coptic text. The image, found in an underground structure of the Saitic funerary complex, represents a secondary use of the site. “A figure of a young man, with curly hair, dressed in a short skirt and with his hand raised is seen the crypt’s walls,” said Josep Padró, head of the Spanish mission, describing the find. “The Spanish mission of Barcelona University has been working in Egypt in cooperation with the Ministry of Antiquities since 1992. During this period, many discoveries were made and this discovery comes as a reward for excavation work this season.”, said Padró.